The adage ‘monkey see monkey do’ could just as easily apply to squirrels. These rodents are very intelligent and learn quickly from humans and from each other. If one squirrel learns how to break into your garden you can be sure that the entire trope will follow suit very soon. Add the fact that squirrels are nimble, persistent and great climbers and you find yourself on the losing side even before the battle of keeping squirrels out of your garden begins. Squirrels eat any vegetable that you might consume including eggplant, beans, tomatoes, sunflowers, figs and bulbs so what you plant isn’t so important in the grand scheme of things. These are good signs to put on you alert to watch your garden more closely. Other critters such as chipmunks can cause similar damage to ensure that you have physically spotted the culprit before taking control measures. Identifying the pest certainly plays a huge role in choosing the most efficient wildlife control method. There are many suggestions on how to keep squirrels out of the garden with varying degrees of success. Only a handful of measures actually work. Most DIYérs tout using home-made and non-toxic repellents such as mint, chili peppers, vinegar, predator urine, garlic or some combination of these. These have moderate success if any at all and most wildlife control experts in Canada consider them old wives’ tales. Commercial repellent sprays are also available but these tend to over-promise on the results. Squirrels are highly adaptable and eventually get used to new smells and scents. You should also be careful about what you spray on plants that you plan to consume. Annoyances such as motion sensitive lights, sprinkler systems and high-frequency sound emitters seem gimmicky at best. Again, no serious wildlife control expert would suggest these. If they work it’s because rodents are naturally apprehensive about changes in their environment. Eventually, the squirrels will become used to these additions and continue their raid undisturbed. You may opt to bring in a predator such as dogs and cats. An example is the Rat Terrier which is a type of dog bred specifically to hunt small animals. Cats and squirrels also don’t see eye-to-eye and a feline companion may be enough to keep the rodents away. Some homeowners have gone as far as to attract natural predators such as owls and hawks but be sure that the new animals won’t cause as much trouble or even more than the squirrels you are attempting to chase away. By far the best way to keep squirrels out of your garden is to install physical barriers using wire mesh, aluminum flashing, netting and/or fencing. Laying wire mesh on the topsoil is a great way to discourage squirrels from digging up your garden. Simply lay the mesh on the spots you have noticed the most squirrel activity. A wire mesh barrier around your garden bed or potted plants are also a great way to keep the squirrels at bay. It may not be a visually attractive garden but at least it will cause the critters to look for some other yard to invade. Installing at least a quarter inch galvanized mesh fencing all around your garden is an equally great solution. Be sure to bury the fence at least a few inches into the ground since squirrels can dig under and through the barrier. Protect your trees by wrapping them with aluminum flashing. Some people suggest that the glare from the aluminum keeps the rodents away. The more plausible explanation is the flashing keeps the squirrels from gnawing on the tree and creates a slippery surface for the otherwise nimble. Keep in mind that it is illegal to harm wildlife in Canada. 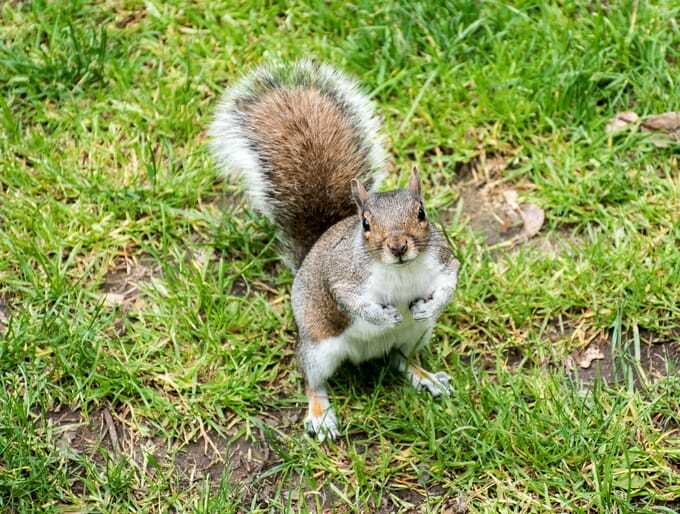 You may be liable to steep fines if you harm squirrels while trapping them even by accident. It is also illegal to transport wildlife for more than a kilometre without the proper permits. Keeping squirrels out of your garden successfully requires multiple measures and deep knowledge of squirrel behaviour. A wildlife removal expert can guarantee that the rodents stay out of your garden for good with little aesthetic or other damage to your garden. Call a professional as soon as possible after spotting the squirrels in your garden. It is only a matter of time before they nest in your attic, inside walls, under the deck or in other spaces where they will difficult to track and remove. A running joke around professional wildlife removal circles is if you have a bird feeder, then you also have a squirrel feeder. The squirrels have a big appetite and waste bird seed by pouring the bird seed they don’t eat to the ground. They’ll dominate the feeder and begin to chew and burrow everywhere. The good news is you can still keep your bird feeder and keep the squirrels off it. This is by far the easiest and most straightforward solution. Squirrels on bird feeders are big enough problems that they now make bird feeders specifically designed with keeping the squirrels off. 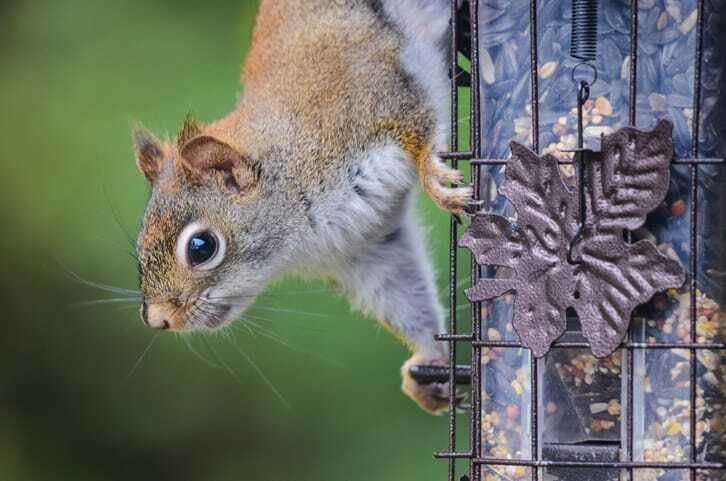 The squirrel-proofing designs vary with some using a weight-sensitive mechanism to lock the food away any time a heavy animal such as a squirrel sits on it. Others have a metal cage around them that can let in small birds access the food but not squirrels. Squirrel baffles are available cheaply at most hardware stores and it is also easy to make one. These are dome or bowl-like additions that install on top or under the bird feeder depending on how the bird feeder is installed. Use a dome at least 15-18 inches wide so the squirrels can’t reach around. The dome facing downwards, for example, prevents the squirrel from continuing on its way up. It also tilts and twirls to make it impossible for the squirrels to patch and access the feeder. Sometimes the solution may be to change the location of the bird feeder away from anything that a squirrel can use as a launch pad such as power lines, house, tree branches and trees. A squirrel can jump up to 10 feet to ensure a generous clearance in this case. Hang your feeder from a thin horizontal wire and install spinners such as thread spools, plastic bottles or short lengths of hoses or pipes on the wire. These additions spin when the squirrels attempt to walk on the wire causing the critters to drop to the ground. Squirrels are very athletic so don’t worry about them getting injured from the fall, they can fall a considerable distance and be merrily on their way. Although squirrels enjoy most types of bird seeds, they appear not to enjoy safflower seed and nyjer. These have a distinctly bitter taste. Just make sure that your birds eat the seeds. Blackbirds, for example, don’t like safflower seeds while chickadees seem to enjoy them. If you have no issues with the squirrels other than eating the bird food, you may opt to give them their own separate feeding station. Ensure that this feeder is easily accessible to the squirrels and has a constant supply of food. Corn is a great inexpensive food that they enjoy. Squirrels can be overwhelming to deal with but there is no reason to injure or harm the animals. Shooting, poisoning, trapping without experience are all terrible ways to deal with wildlife of any kind. Keep in mind that it is illegal to harm or kill wildlife and to transport wildlife for more than a kilometre without a permit. Squirrels on your yard may attempt to nest in the attic, deck, shed or other crawl spaces. Call a wildlife removal company in Canada that handles wildlife humanely. The expert will also seal your home to prevent the critters from invading as well as keep them out of your yard permanently. Ask for a warranty for the service to ensure that the problem is solved once and for all.